It’s apparently retro month for Nintendo. After the insanely successful launch of Pokémon Go, the video game company is dipping way back in the vault for the holiday season. 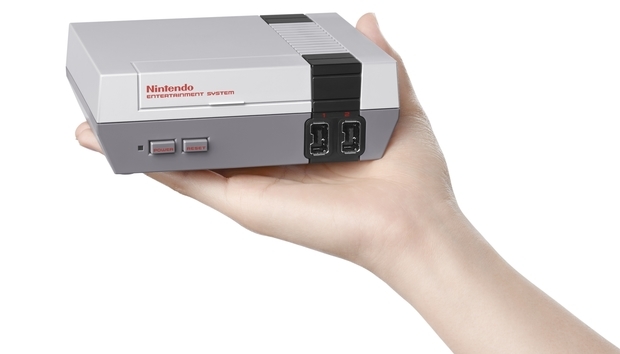 Starting November 11, Nintendo is bringing back a miniaturized replica of the original Nintendo Entertainment System. The $60 Mini Collector’s Edition NES comes with a single controller replica and 30 classic NES games built-in to the system—no cartridge necessary. You can pick-up an extra classic controller for $10. Don’t count on using your old NES controllers—if they’re still kicking—with the new system. The new controllers are designed to plug-in to the mini NES as well as the Wii Remote Control. When paired with the Wii remote, you can use the replica controller to play Virtual NES Console games on your Wii or Wii U. In another nod to the modern world, the mini NES won’t force you to pause your game overnight to keep from losing your progress. Each game has built-in suspend points that let you shut down for the night, and come back to the same point in the game the next day. That’s an all-star lineup, but purists may be disappointed that Nintendo went with the re-release version of Punch Out!! that drops Mike Tyson from the game. There’s also a couple of games in this list that were retro games even on the NES, including the Donkey Kong games and Pac-Man. Still, it’s nice to see these “retro retro” games included, since Nintendo’s classic library wouldn’t be complete without them. The story behind the story: Nintendo’s plan may seem a little ridiculous to emulation fans. Within half an hour, you can go from zero to a full NES gaming setup on a Raspberry Pi that plugs into your TV’s HDMI port. But those setups, such as Retro Pie, only provide the games in their original form, and sometimes they won’t play at all or are a little buggy. On top of that, you won’t have the controller or the new built-in suspend points to save your progress. Not to mention the fact that the games you download for RetroPie aren’t legitimate copies anyway, and emulation’s a legal grey area. The mini NES isn’t really for technically capable people who know how to cobble together a Raspberry Pi, anyway. This console will appeal to the masses who still harbor fond memories of their NES-tinged childhood. When those people see this console on store shelves—and for just $60—there will no doubt be a lot of impulse buys so parents can replay these games with their kids.